R58800-06-BK Rocket® BLUE™ Multipurpose Needle Drainage Ward Procedure Packs offer a purpose designed, cost-effective solution for routine fluid drainage procedures in the department or ward settings with the additional ease of a complete pack to save time and cost. For the drainage of body fluids including ascites, urine and pleural fluid. For insertion into the abdominal cavity, chest and urinary bladder using a ‘direct stab’ technique combined with aspiration and/or ultrasound guidance. 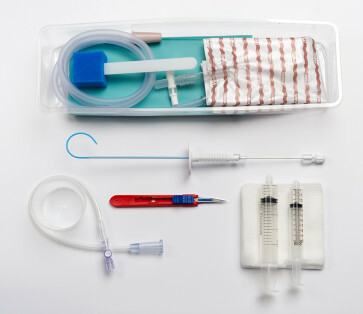 6FG needle drain x 20cm with trocar needle, 30cm drain bag connection set + 2 way tap, 2000ml drainage bag with empty port, 20ml, 12ml syringes, luer lock, 21g x 1.5" needle, 25g x 5/8" needle, 5in Sharp/Blunt Scissors, 60ml gallipot, Pair polyco gloves, medium, Gauze swabs x 5, Retractable safety scalpel No.11, 11x15cm ‘Mepore’ dressing, 50x60m adhesive fenestrated drape, Instructions for Use. Sterile, for single use. Carton: 5 ward procedure packs. CE MARKED, PURPOSE DESIGNED DEVICE, designed specifically for paracentesis and drainage of abdominal ascites, urinary bladder and other drainage applications which avoids the risks of inappropriate use of non-specific devices such as generic suprapubic drains. SOFT, KINK FREE 6FG catheter material, improves patient comfort and prevents unnecessary catheter blockage caused by thin walled materials. 1CM CATHETER MARKINGS to aid safer, controlled insertion. SOFT INTEGRAL STITCH PLATE combined with flexible tube support, provides simple, secure fixation after insertion. REMOVABLE NEEDLE CAP permits aspiration to aid correct placement during insertion. DRAINAGE BAG CONNECTION SET included to make insertion and connection to a wide range of drainage options quick and secure. SAFETY SCAPEL INCLUDED to improve ease of insertion and maintain user safety in accordance with the guidance of COUNCIL DIRECTIVE 2010-32-EU Needlestick Injuries.